You are here: Home / IT general / You say day-ta, I say dar-ta – united by a common language. Being a native English-speaker I count my blessings that English is the lingua franca (latin pun intended!) in the worlds of IT and commerce. I can be thankful for the legacy of the British Empire and the continuing influence of the USA as the world’s creative and commercial powerhouse for the fact that I don’t have to learn other languages! A bit lazy, but true. 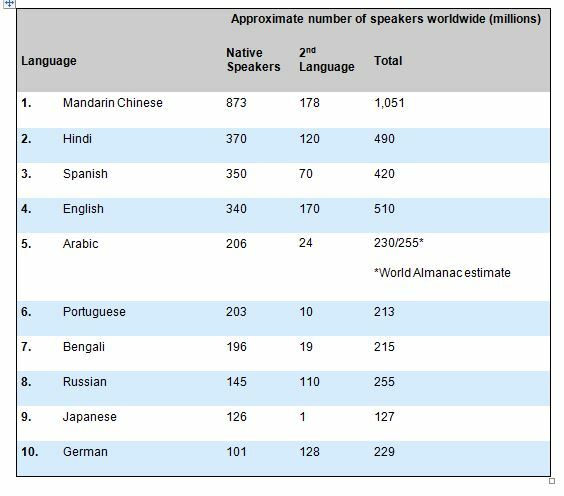 I am not a historian or a linguist, but to a layman there seems to be no inherent reason why English, and not French, Spanish or Mandarin should dominate cyberspace, or be used in air traffic control towers throughout the world, or be spoken on the floor at the United Nations. Or is there? One thing that English offers is an incredible breadth and depth of vocabulary and meaning. The language of the Anglo-Saxons and the new English cultural identity in the middle ages was already a Germanic-Latin mongrel, and continues to evolve and grow with each new influx of speakers and uses. The other strong candidate for a truly world language in the C18th and C19th, as Britain expanded its colonial influence, was French. However, the English (and the Scottish, Welsh and Irish) proved themselves better exporters of their language, helped in no small part by an ethos of free trade and external investment, as well as political and military successes. Until very recently, last week in fact, more than 100 million French-speakers on five continents were not officially allowed to use bowdlerized (slang) English or non-French words. 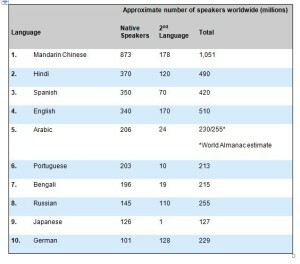 Surprisingly English is only 4th on this list – punching way above its weight – French is in 18th position. I have heard it said, somewhat facetiously that the British Empire has given the world two gifts, Association Football and the Anglo-Saxon expletive ‘F**k off’. I prefer to think of it as the gifts of a world language and a sense of fair play! Working in the IT industry I have come across many different nationalities involved in software development projects and related operational support roles, colleagues and suppliers working in the UK, ‘near shore’ (such as Spanish & Polish developers) and ‘off shore’ (Indian & Chinese, developers, testers and support staff). I have also worked in Ireland and America, respectively, the first country to be colonised, and the first to break away from the Mother Country! But, I am able to communicate effectively and work collaboratively with English and non-English-speakers in my industry. There can be subtle cultural differences, jargon, and domain-specific terminology to recognise and adapt to, but the core ‘essence’ of the IT elements does provide a common point of reference, a set of basic building blocks to construct very complex technological and human systems. As always thank you for your feedback and comments on this post, or sign up for the newsletter to get the good stuff delivered straight to your inbox! Hi Tony, I also work in the IT field, training people how to get more out of Microsoft Office in particular. No come across many people who don’t have a English as their first language on my courses. Especially in companies where the people are young. It is always interesting to find different ways to explain things that everyone can understand. I am always amazed at their proficiency in English too! Thanks for making me think about this a bit more. Hi Shelley, thanks for your kind comments. Thinking is good, i’m happy to help with a prompt or two 🙂 I’m not an educator by profession, but am gradually moving into this arena…did you read my blog about my portfolio career?